It's not every day that an animal this uncommon drops by for a snack. Susan Lichty was glancing out across the driveway of her New Hampshire home recently when she spotted what looked to be someone's white pet moseying through the foliage. It's a good thing she stopped to take a closer look, though, or else she might have failed to notice just what a remarkable creature it truly was. "I saw an animal, a white animal, and I thought at first it was a cat. Then I saw the way it was lumbering along, and I knew it was not a cat," Lichty told the Concord Monitor. Nope. Not a cat. 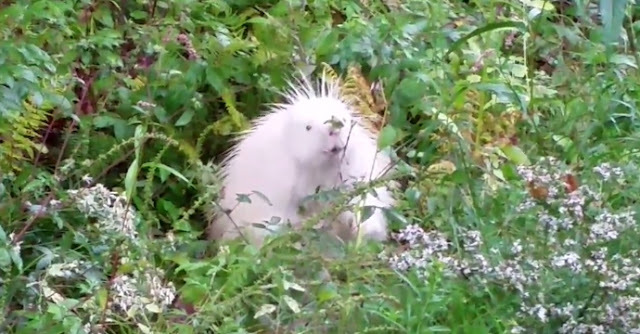 Actually, he's a glorious albino porcupine — who Lichty caught on film nibbling on some leafy greens. According to biologists, albinism affects only about 1 in 10,000 porcupines, which means the pale-hued animal seen that day is very rare indeed. Fortunately, despite the fact that he's had a much tougher time hiding from threats, the hungry porcupine has made it into adulthood looking perfectly plump and healthy, winning the hearts of folks lucky enough to see him. "It was definitely an albino, with red eyes," Litchy told the Monitor "I was able to watch it for quite some time before it walked away. It was cute." Responses to "Incredible Encounter With World's Rarest Porcupines"
So, the eye witness saw red eyes but our "resident expert" ^^^ doesn't agree. Where do people get off thinking they are superior to others? Who do you believe?